When I visited the Millicent Rogers Museum exhibition, “A Feast for the Eyes, Rio Grande Blankets from the Collection”, I wanted to view the details of the two main forms of weaving the textiles. Rio Grande textiles are traditionally woven on European horizontal two-harness looms, which limit the width of the textile, although the length is only limited by the length of the warps. Textiles of four to five-and-a-half feet in width were usually made by one of two methods: double width or two widths seamed. For double width textiles an additional two harnesses were added to the loom behind and below the top harnesses and the weaver shuttled between the top and bottom harnesses in a continuous weave. 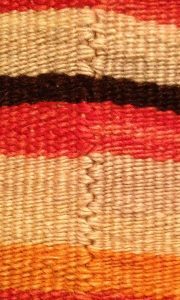 For strength, additional warps placed closely together were added at the join of the top and bottom harnesses, resulting in the telltale ridges in the vertical center of textiles woven in this manner. Textiles made from two widths seamed are just that: two separate textiles are woven, using the same pattern of banding and stripes for each, and then seamed together along the vertical center. 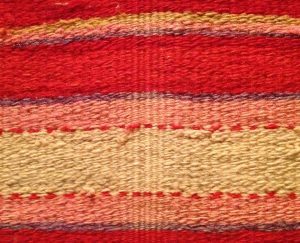 This method requires great weaving skill to create two separate textiles whose bands will perfectly align when the textiles are seamed together. The Millicent Rogers Museum exhibition provided a myriad of examples of each weaving method. Although I had studied diagrams and seen photographs of these weaving methods, there is no comparison with the understanding that results from viewing actual textiles in detail.